As my previous blog posts have discussed, coral reefs are not only ecologically diverse but also diverse in the types of interactions expressed between individuals and communities. My first post explored some examples of mutualistic relationships on coral reefs while my last post used the remora as a classic example commensalism on reefs. Today, I will talk about the third main type of symbiosis: parasitism. Unlike commensal relationships, which are often difficult to categorize (because few interactions are wholly commensal), parasitic relationships are abundant in many of Earth’s ecosystems. On coral reefs, parasitic interactions are incredibly common and varied, as reef fish are excellent and abundant hosts. Because of this diversity, this post will focus on several different examples of the many kinds of parasitic mechanisms found on reefs. The main parasites that are found in or on reef fish are isopods and copepods, which are small crustaceans1. A famous example of parasitism on reefs is the tongue-eating louse of the species Cymothoa exigua. Also referred to as “fish lice”, this marine isopod is known to remove the tongue of fish hosts by extracting blood, and then to replace the organ by acting as the fish’s new tongue! Though the isopod seems scary (in fact, it was the inspiration behind the 2012 horror film The Bay), little harm is done to the fish aside from the removal of its tongue. The isopod’s body acts as a functional tongue, and feeds on mucus secreted by the fish. This is actually the only parasitic animal known to functionally replace one of its host’s organs2. Image 1 below depicts a tongue-eating louse inside of a reef fish. Image 1: The crustacean Cymothoa exigua lives inside the mouth of a fish of the subfamily Amphiprioninae, replacing the fish’s tongue. Another common example of parasitic reef dwellers are flatworms. Ranging in size, color, and species, these animals of the phylum Platyhelminthes are parasitic on reefs in many different ways. Some species are corallivorous, which occasionally poses a threat to ecosystems that are already seeing heavy loss of coral cover. A study on the Acropora-eating flatworm Amakusaplana acroporae, which has only been found once in nature (in the Great Barrier Reef) but several times in aquariums, found that it could be a major threat to Acropora-heavy areas3. 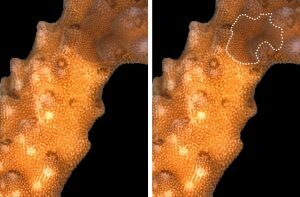 The flatworm’s unique camouflaging tactic is accomplished by ingesting the coral’s symbiotic algae (Symbiodinium) and distributing some of it (undigested) throughout its body. This gives Amakusaplana the appearance of its Acropora host, allowing it to feed on the coral undisturbed by predators. Image 2 shows how closely the flatworm resembles its coral host. Image 2: Camouflaged Amakusaplana on a host coral. Credit: The University of Southampton. The varied and numerous instances of parasitism on reefs are usually kept in balance through natural coral reef ecosystem processes. Sometimes, however, these natural processes are interrupted by the introduction of invasive species. This is the case in Florida, where in the 1990’s, two species of lionfish (Pterois volitans and Pterois miles) were introduced into the Atlantic and Caribbean. Their progression through these areas since their introduction is shown in Figure 1 below. Native to the Indo-Pacific, lionfish eat almost anything they can fit into their mouths4. They can be considered parasites of the entire coral reef ecosystem, as their broad diets can interfere with established food chains, while they don’t have many predators because their bodies are lined with venomous spines. Lionfish are now one of the most classic examples of invasive species, as they have established themselves throughout the region and pose a major threat to native species. Figure 1: Chronological occurrences of lionfish (Pterois volitans and P. miles) in the Western Atlantic as of December 20105. While what can only be described as a lionfish invasion in the Western Atlantic is an unfortunate and ongoing occurrence, some ecologists see it as a way to further research on conservation ecology and marine biogeography5. By studying the lionfish, scientists at the George Washington University were able to test proposed scenarios regarding Greater Caribbean connectivity and phylogeographical breaks5. In this way, there could be a bright side to ecological issues like invasive parasites. Well, you’ve reached the end! Thank you for reading my blog posts – I hope you were able to learn a little something about symbiotic relationships on reefs, and I encourage all readers to look into the issues discussed throughout. The impact that humans have on reefs don’t just affect their physical structures. The myriad interactions found on reefs are also disrupted by anthropogenically influenced events like coral bleaching and the introduction of invasive species to non-native habitats. In order to curb the negative impacts of these occurrences, human societies have to engage in symbioses of our own, mutualistically working toward bettering the rainforests of the sea. 1“Ocean Parasites: More Common Than You Think.” Aquanews Online Scuba Magazine. Leisure Pro, 13 Aug. 2016. Web. 17 Aug. 2017. 2Brusca, Richard C., and Matthew R. Gilligan. “Tongue Replacement in a Marine Fish (Lutjanus Guttatus) by a Parasitic Isopod (Crustacea: Isopoda).” Copeia, vol. 1983, no. 3, 1983, pp. 813–816., www.jstor.org/stable/1444352. This entry was posted in Uncategorized and tagged 2017, Briley, flatworm, lionfish, tongue-eating louse. Bookmark the permalink.